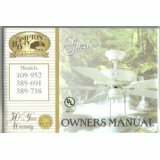 We have had many requests for installation instructions and/or owner's manuals for certain model ceiling fans. 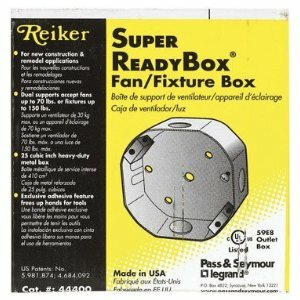 However, in most cases, assembling and installing a fan is very standard. Most fans have very similar parts and therefore are put together in much the same way. It should be noted that it is recommended the outlet box/and or support be rated for a weight greater than the actual weight of the fan. You also have to factor in the centrifugal force of the rotating blades, and allow for any vibrations, etc. 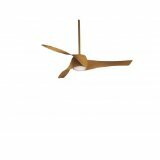 A fan that weighs 25lbs or so is usually recommended to have a support rated for 30-40lbs or more. But in any case, in order to have a legal installation, the fan (and outlet box) should be attached to ceiling joist or rated fan brace. If the outlet box is loose or unsupported you will need to brace it further. Anyone with a bit of mechanical and electrical aptitude should have no problem installing a fan. However if you are in a situation where there is not already an existing power supply and support, you might want to call a professional if you are not comfortable and knowledgeable working in this area. 1. Some pieces of the fan require assembly before hanging. Attach the blades to the blade brackets. In the case of a downrod fan, slip the canopy over the downrod and attach the downrod to the fan. In the case of a close mount (not hugger) fan, attach the canopy directly to the motor. In some cases you may want to attach the light fitter (should one apply) to the motor before assembly, in other cases it will be easier to attach once the fan is on the ceiling. Some fans also require the switch housing be plugged in and attached. In any case, at this point the fan should consist of 3 or 4 types of pieces: the motor assembly, the mounting bracket, the blades, and, if applicable, the light attachments. 2. 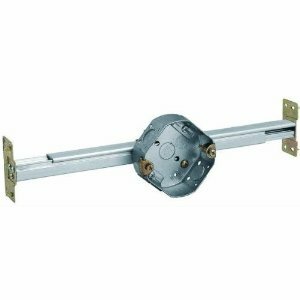 Attach the mounting bracket to the fan brace and/or ceiling outlet box. 3. Hang the motor assembly from the mounting bracket. In some cases this will be via a small hook, in other cases the ball on the end of the downrod will fit directly in the bracket. Be sure the groove in the ball lines up with the tab in the bracket and/or canopy. 4. Connect the wires. 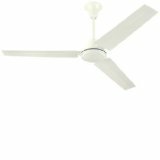 Refer to the Ceiling Fan Wiring Guide for more information. 5. Attach the canopy to the mounting bracket. In the case of some fans this may be 2 thumbscrews on the bottom, others may have as many as four screws on the side. In close-mount fans and some downrod fans the canopy is load bearing, in other cases it is purely decorative. In downrod fans be sure the ball is (still) lined up with the tab in the bracket/canopy. If the canopy has a decorative ring to cover the screws, attach that. 5a. For hugger fans, attach the motor to the mounting bracket, in most cases with four locknuts (some fans may vary). Attach the motor housing cover to the mounting bracket (usually with four screws). 6. Attach the blades to the motor via the blade brackets. Each blade bracket uses two screws which fit directly to the motor or the flywheel. 7. Attach the light fitter, if applicable and if it has not already been attached. 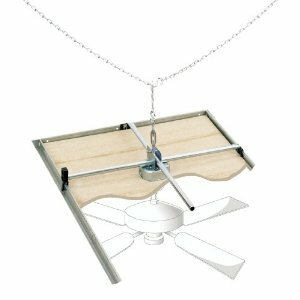 Attach the glass to the light kit, and any other decorative accessories the fan may include. So, what should it cost to have a ceiling fan installed, or removed from the home? This frequently asked question is answered here, so you get an idea of the cost of installing or removing a ceiling fan from your home. 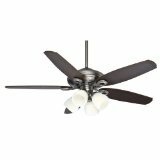 How do I install my ceiling fan? I need help installing my ceiling fan, what should I do? 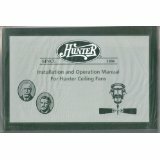 I can't find the manual for my ceiling fan and need help to install it. What should I do? These questions answered and more.